Sometimes, it is not necessary to build brand new structures in order to secure coatal areas and human infrastructure from erosion and flooding, as often “natural structures” are in place. Then, it is crucial that human activity focuses on safeguarding such zero-cost resources with proper maintenance and efficient solutions. The case of Deer Island is self-explanatory. Sometimes, natural “structures” help protect cities, harbors and coastal areas from destructive natural forces such as hurricanes and storms. The US are frequently hit by such phenomena, which cause huge damage to the environment and human infrastructure. The case of Deer Island, in the Mississippi Sound close to Biloxi Bay, is itself significant. A 4.5 mile long natural protection stretched through the sea, has long provided both ecosystem habitat and protection from erosion, reducing the energy of wind and waves moving on-shore. In the past, devastating hurricanes reduced the effectiveness of this natural dike. In the past 25 years, the beaches of the island were eroded, an entire section of the island was breached, the elevation reduced and forested areas erased. In order to safeguard this natural protection, Maccaferri performed works aimed, first, at closing the West End Breach. To fill the 4,300-foot west end breach and restore the southern shoreline, a total of 1.95 million cubic yards of sand was needed. The sand was locally sourced and hydraulically dredged from a nearby borrow site. MacTubes were placed in the breach template below sea level and utilized a robust, strategic native planting effort involving over 300,000 plants. This design allowed the project to minimize the overall boundary footprint, and maintain natural shoreline egress and ingress activities for faunal species. This effort also reduced the need for – and associated cost of – rock resources and the construction and maintenance of over-dike access points. 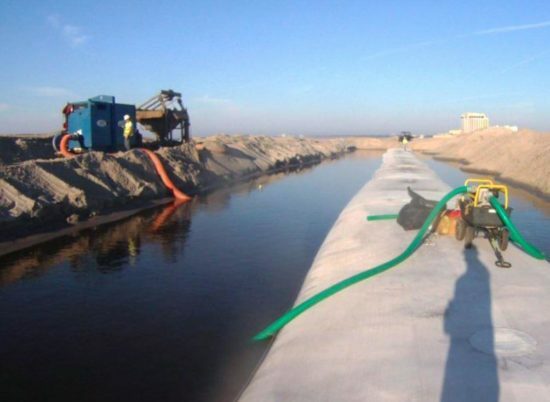 For more information about Maccaferri coastal protection and hydraulic works, please contact us!